In every culture that I’ve been exposed to, holidays are about food choices. We associate ritual and event with the meals we eat at a specific time of year, or after a celebration. For those of us in the United States, Thanksgiving is one of the biggest food holidays of the year; a holiday that’s all about what you eat. Traditionally, Thanksgiving dinner starts at four in the afternoon, and doesn’t end until everybody is more stuffed than the turkey, lying around in a helpless food coma. But Thanksgiving does not have to be the end of your diet. If you plan intelligently, and you pay attention to your body, you can enjoy the holidays as much as anybody, and not blow your diet. Here are a few tips I’ve found useful when Thanksgiving rolls around. One of the real advantages of low-carb high-fat eating is that the body stops craving carbohydrates. A good friend of mine, Jill Escher, wrote a book on low-carb eating with a great cartoon that illustrates what the grocery store looks like once you’ve started a low-carb high-fat diet. Around the edges of the store, you see the delicious meat, dairy, and produce sections. In the middle, you to see isles and aisles of rocks. All those carbohydrate laden foods that stores tend to stock in the aisles odon’t really appeal to you once you’ve started a low-carb high-fat diet. The problem is that this effect doesn’t kick in until you’ve been doing it for a week or longer. For some people it comes sooner, for some people it’s longer, but in general you should count on at least a week after you start a low-carb high-fat diet before you lose the craving for those carbohydrates. Give me take longer for your habits to go away, but the cravings should die down. The lesson here is that starting a low-carb high-fat diet right before a holiday celebration can be a recipe for disaster. Your body won’t be smart enough to know what it craves yet, and your instincts will still tell you to eat all of those sweet starchy foods you’re familiar with. So while I’m a big fan of starting a diet immediately, rather than waiting for a specific date or specific time, I don’t recommend starting a low-carb high-fat diet right before a holiday. It will be just as good for you a few days later. Many experts on low-carb high-fat dieting recommend scheduling a short reload of carbohydrates once a week while you’re following a low-carb high-fat eating program. The issue is controversial. Some people think that the reload is a chance for ketosis to be broken, leading to several more days of inappropriate carb cravings. Other people are convinced that carbohydrate addiction is a pattern that can’t be broken as easily once it is started again, like alcoholism. You need to figure out what works for you. In my experience, doing a carb reload is safe, as long as I limit the time. For example, if I make a weekly 24-hour carb reload part of my life, I need to make sure that those 24 hours don’t start right after midnight the day before, and end just seconds before midnight the next day. It’s amazing how many carbohydrates it’s possible to even that short timeframe. When I notice myself craving that kind of reload, I have to re-examine how well I’ve been following my low-carb diet. Because those cravings just don’t happen when I follow the diet carefully. The familiarity of those carbohydrates can be very enjoyable, even though they don’t taste as good after your body is used to healthy high-fat low-carb eating. Bread feels doughy and gummy. Starches just dull the taste of the fats and proteins they carry. Sweets taste too sweet. Sugar can trigger jitters. It’s just not that much fun. But if you are carb reloading on a regular basis, try to schedule your carb reload around the date of the holiday. If you’ve been doing low-carb high-fat eating for a while, you may be pleasantly surprised by how little you actually crave those carb rich foods, even when you’re permitted to eat them. It’s an old chestnut, but eating before you go to Thanksgiving dinner can really make a difference. As often as not, if you’re going to somebody else’s home for Thanksgiving dinner, much of the meal will be carbohydrate-based. 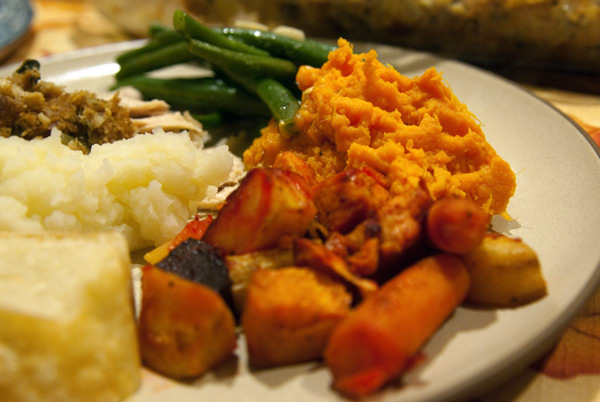 Mashed potatoes, sweet potatoes, stuffing, cranberry sauce, eggnog… it’s a minefield. Even if your body isn’t craving those foods, you may find it difficult to avoid them just out of social convention or habit. Sometimes you won’t even have the advantage of a buffet, where you can pick and choose the foods you want. I spent my last Thanksgiving at a club where dinner was served at the table, on pre-arranged plates rather than family-style. Before the meal arrived, everyone spent a long time sitting at the table talking, with hot bread rolls standing in front of us. My plate contained a few thin slices of turkey, a small stalk of broccoli, and huge piles of mashed potatoes, stuffing, and sweet potatoes. The gravy was very clearly thickened with flour, and had been liberally poured all over everything. In anticipation of this, I’d eaten some cheese sticks before I left. In addition to being convenient to carry with you, cheese sticks are moderate-fat, moderate-protein, low carb, and very filling. I always find that after a few sticks of cheese, my hunger goes away, and I don’t really think about food. I as not only not craving the carbohydrates on my plate, I actually could’ve gone without eating at all. But I just scraped away the gravy, ate the turkey and the broccoli with a few pats of butter from the bread melted in, and enjoyed the stimulating conversation my unusual but healthy food choices inspired. Unless you have a hostess standing over you, asking exactly what you thought of the stuffing, and you’re afraid to offend her by telling her that you didn’t eat it, having something to eat before you go should help you not indulge in the foods you’re trying to avoid. Low-carb high-fat eating will help too, because you simply won’t crave those foods to begin with. Chewing gum is sometimes not recommended for people on a low-carb high-fat diet. Sugarless gum, although it does not actually have any carbs, has a sweet taste. Some experts believe that having a sweet taste in your mouth triggers cravings. Even if you are not getting any carbohydrates, your body can respond to a sweet taste with an insulin burst, just as if you had been eating sugar. It’s something each of us needs to find out about ourselves, and be cautious of. But if you’re fortunate enough that chewing sugarless gum doesn’t trigger other cravings, having something in your mouth you chew can help you avoid the habit of eating inappropriate foods. This is particularly useful if you’re cooking Thanksgiving dinner. Frequently, as the cook, it’s considered necessary to taste and evaluate your cooking as you go. But usually it’s just a habit cooks get into. If you can chew gum, chewing gum while you’re cooking can help break the habit of tasting your food as you go. Don’t worry that it’s going to mean you will ruin everything that you cook. If you’re good enough cook that you can make a Thanksgiving dinner, a little chewing gum shouldn’t get in your way. If you’re not a good cook enough cook to make a Thanksgiving dinner, chewing gum is not going to be the reason the meal fails. I’m sorry to have to tell you that. Thanksgiving is one of the holidays that people save up for. People will skip lunch, or even skip breakfast, on the day of the Thanksgiving feast. They want to make room for all of that wonderful food. This is a recipe for disaster. Consciously making yourself hungry before a meal is an invitation to indulgence. Even if you don’t crave the carbohydrates, they’re going to be right in front of you, and it’s going to be very hard to avoid them if you’re physically hungry. Many low-carb high-fat experts say that even too much protein is a problem on a low-carb high-fat diet. The body is able to convert excess protein into sugars. If you chow down on massive amounts of turkey, you could still be causing problems that your body will pay for later. Eat breakfast on Thanksgiving. Eat a good healthy lunch on Thanksgiving. If you have an afternoon snack, eat it. The more routinely you approach your food on a holiday like Thanksgiving, the less that huge meal at the end of the day is going to impact your diet experience. So let’s say that you’re one of those people who does not have a carb load scheduled in their diet, and you go crazy on Thanksgiving. You eat everything front of you, have seconds, go back for another dessert, and end the day in a bloated stupor with pumpkin pie dripping out of the corner of your mouth. It’s not a pretty picture, but it happens. Forgive yourself. This isn’t the end of the world. This isn’t even such a great tragedy. You’ve made the mistake, and your body will punish you appropriately. If you’ve been doing low-carb high-fat eating for a while, you should notice the effects immediately and dramatically. If you’re new to low-carb high-fat dieting, this is going to slow down your introduction. But that’s it. The only person you’re responsible to on your diet is yourself. Your body will tell you what it needs, and if you pay attention, it will reward you with health, energy, and comfort. You always have a choice of what you want to do. If you feel like doing something unhealthy, you’re an adult and you can. Don’t let one mistake stop you from waking up the next morning and continuing along the path you’ve chosen. I don’t know about you, but for me dieting in general is about making food choices that are more intelligent than the ones I would make instinctually. That’s one of the things that I love about low-carb high-fat dieting. After about a week, the food choices feel so natural, all I have to fight are my habits. My body starts telling me right away when and what I actually want to eat, and if I listen and pay attention, it rewards me. The advantage of Thanksgiving for low-carb high-fat heaters is that it is a holiday designed around turkey. Turkey is an excellent food for low-carb high-fat dieters. Take some extra dark meat, eat the skin, avoid the gravy, and have a blast.